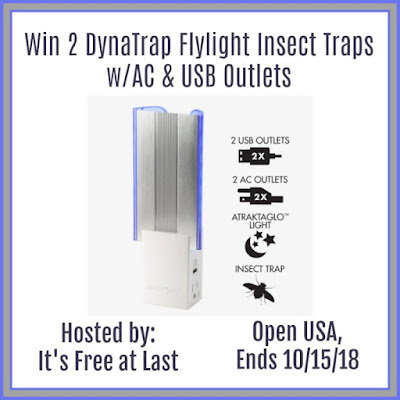 This giveaway is hosted by It's Free at Last and sponsored by DynaTrap. I live in an apartment and one would think that no flying insects enter my abode--you couldn't be more wrong! Those little flying monsters come in through screens and heaven only knows where else--I sure don't. If Baby, my cat, happens to spot one--the chase is on--which results in objects falling off tables etc. 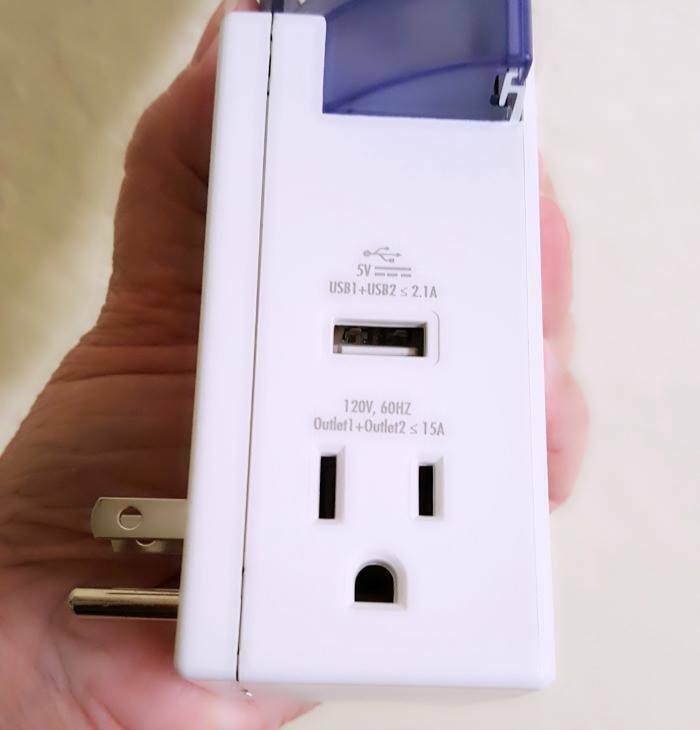 I was very happy to read in Sherryl's review (click below to read) that this particular model is made for the indoors. I also love that it is chemical free!! One winner will receive 2 of these Insect traps-in my case I would have one in the kitchen and one in the bedroom!! Where would you want these in your home? Fill out the form below for a chance to be the winner! Make sure to read Sherryl's review HERE. 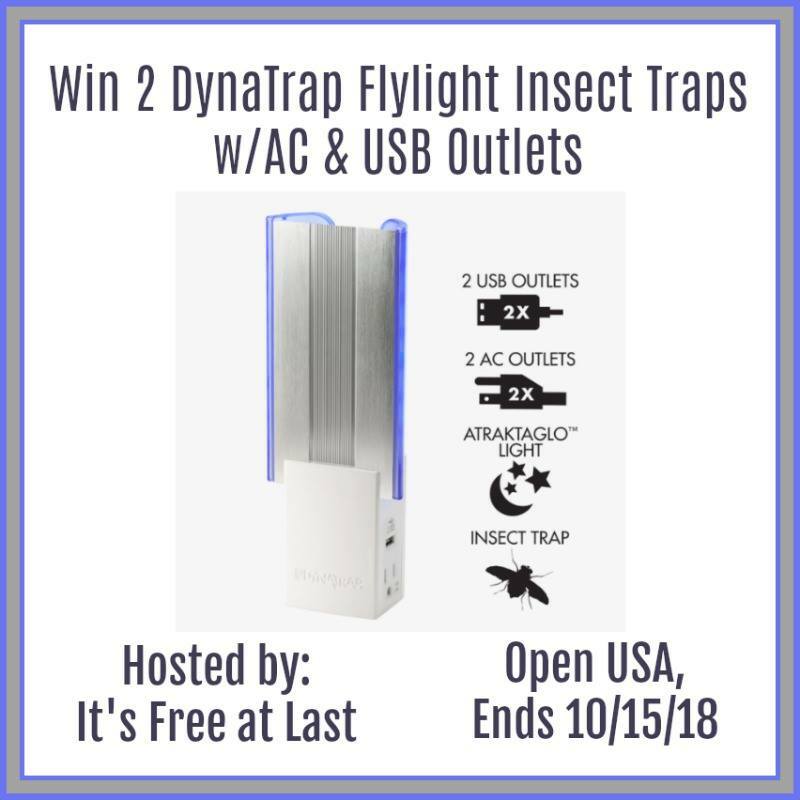 One (1) winner will receive 2 DynaTrap Flylight Insect Traps w/AC & USB Outlets! The giveaway ends October 15, 2018 @ 11:59 PM EST. I'm not doing anything right now, this is a great idea! I keep a flyswatter stuck in a seat cushion so it's at hand anytime a flying insect invades my space. behinds us actually leaves their back door standing wide open all day long like 12 hours a day! No screen door or anything. I would hate to go in that house. I keep flying insects under control by swatting at them. It's not very effective, lol. Thanks for the giveaway! We have sticky tapes hanging by the back door. Makes a dent but definitely doesn't keep the house pest free. I have an electric flyswatter. I got my trusty flyswatter.